I was invited to conduct a product review for a toy meant for boys. This is my first product review and I was rather excited about it. When the package finally came (Thanks, FedEx).... Baby G was even more excited than I was. 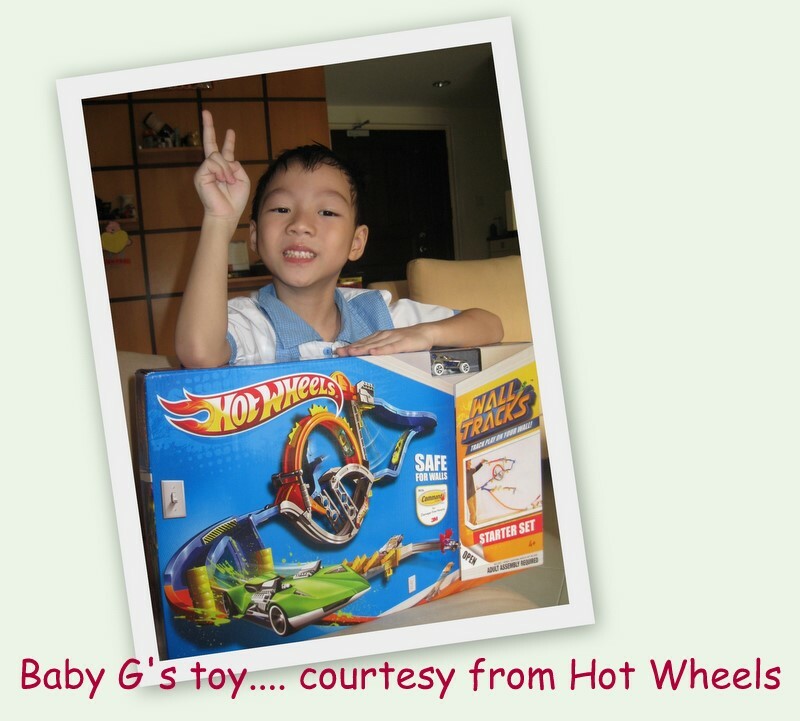 He couldn't resist waiting til the evening and I allowed him to open up the package just before going off for school. He ooh-ed and ahh-ed at the package and he couldn't wait til he came back from school to tear it open. 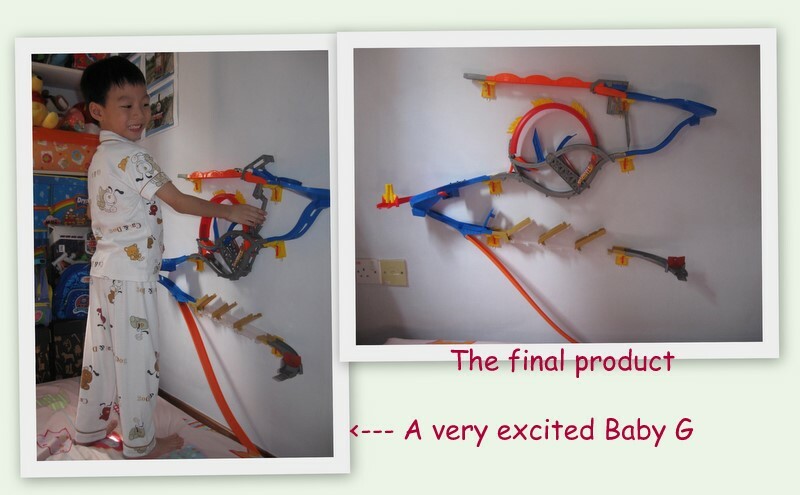 This is an innovative version of Hot Wheels on Walls instead of on floors. 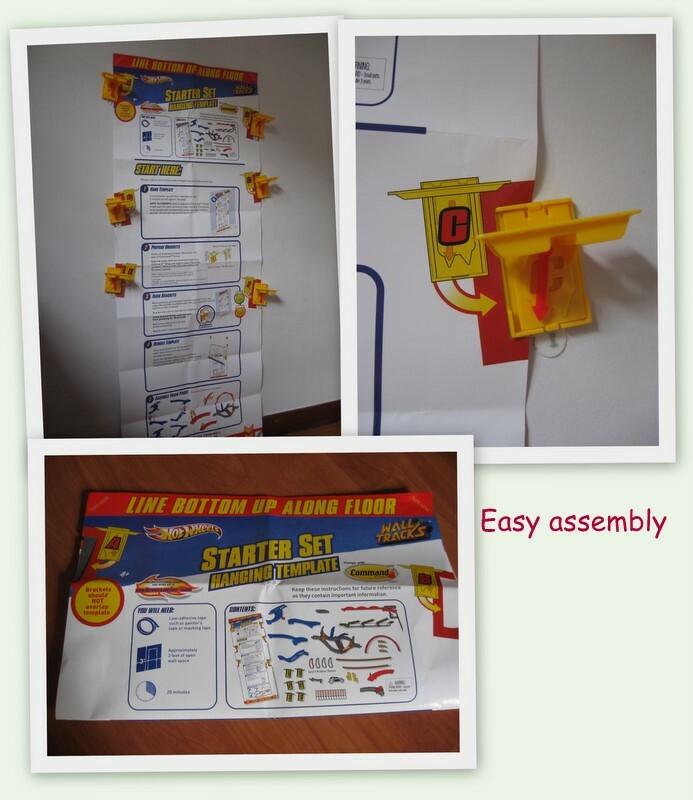 Some assembly by adults is required. But the intructions were easy to follow with appropriate pictures to make it even more fool-proof. While I was busy assembling the 'hooks' on the walls, Baby G helped by fixing up the larger pieces with a bit of Daddy's assistance. Lucky I have an entire wall space to put the toy up, else I would have to move it to the living room. 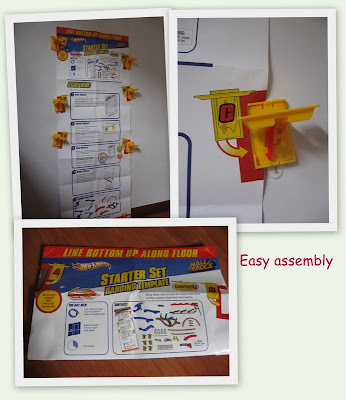 This toy is not suitable if you don't have at least 1.5m of wall-to-wall space. After about 20mins, viola!.... the toy is finally up. For the next 2hrs, Baby G was trying out the different variations of the wall tracks and see how fast the cars could go. We managed to find other Hot Wheel cars from his toybox to try out on the tracks. It is definitely much more fun with more cars. Warning: As the cars travel on the tracks, it gains some momentum & when it leaps off the tracks, stay away from the car. In the end, I had to move the mattress so that when the car leaps off the tracks, it doesn't hit hard on my floor. But... the problem is...... should I leave it on the wall or should I dismantle it?